Long credit cycles like the current one always end with a crash. But first they deteriorate. The headline numbers remain positive while under the surface a growing list of sectors start to falter. It’s only when the latter reach a critical mass that market psychology turns dark. (Bloomberg) – Amid all the reflection on the 10-year anniversary of the start of the subprime loan crisis, here’s a throwback that investors could probably do without. There’s a section of the auto-loan market — known in industry parlance as deep subprime — where delinquency rates have ticked up to levels last seen in 2007, according to data compiled by credit reporting bureau Equifax. “Performance of recent deep subprime vintages is awful,” Equifax said in a slide show on second-quarter credit trends. Analysts have been warning for years that subprime car loans pose a threat to lenders as delinquency rates have edged higher since reaching a post-recession low in 2012. But it wasn’t until last quarter that the least creditworthy borrowers started to show the kinds of late payment profiles that accompanied the start of the financial crisis. (Zero Hedge) – The U.S. auto market is at an interesting crossroads with used car prices crashing to new lows every month while new car prices continue to defy gravity courtesy of a somewhat ‘frothy’, if not suicidal, lending market that has seemingly decided that anyone with a pulse is financially qualified for a $0 down, 0% interest, 80 month loan on a brand new $40,000 luxury vehicle of their choice. As the Labor Department’s consumer-price index data showed last Friday, used car prices once again dropped in July to the lowest level since the ‘great recession’ of 2009. In fact, since the end of 2015, the cost of used vehicles has dropped in all but three months and are now roughly 10% off their 2013 high. (Bloomberg) – It could be the beginning of the end for an 18-month rally in junk bonds. A high-yield bond fund run by BlackRock Inc. slumped on Thursday to its lowest level since March, a day after Morgan Stanley warned a correction may already be underway. The cost of protecting speculative-grade bonds against default in the credit-default swap market climbed to its highest level since July 6. Investors demanded the most extra yield in almost a month to buy junk debt, according to a Bloomberg Barclays index fixed late Wednesday. (CNBC) – Retail stocks are only going to get uglier, former department store executive Jan Kniffen said Monday. The S&P consumer discretionary sector has fallen about 2.6 percent from one month ago versus the S&P 500’s loss of less than half a percent. Kniffen said on “Squawk on The Street” that many stores will post bad traffic and same-store sales comparisons this year. Even Black Friday won’t be enough to save many struggling companies, he said. All of this is being driven by “things going online,” Kniffen added. Kniffen said he expects many more bankruptcies, including Sears as early as next month, and said more strategic mergers are likely. (Bloomberg) – U.S. stocks have been able to hit fresh highs this year despite a dearth of demand from a key source of buying. Share repurchases by American companies this year are down 20 percent from this time a year ago, according to Societe Generale global head of quantitative strategy Andrew Lapthorne. Ultra-low borrowing costs had encouraged large firms to issue debt to buy back their own stock, thereby providing a tailwind to earnings-per-share growth. “Perhaps over-leveraged U.S. companies have finally reached a limit on being able to borrow simply to support their own shares,” writes Lapthorne. Whether this is enough to break through the complacency won’t be known until after the fact. But it does fit the historical peak-cycle pattern of sub-sectors faltering before the broader economy. Stay tuned. CAMBRIDGE – As US and European political leaders fret about the future of quality jobs, they would do well to look at the far bigger problems faced by developing Asia – problems that threaten to place massive downward pressure on global wages. In India, where per capita income is roughly a tenth that of the United States, more than ten million people per year are leaving the countryside and pouring into urban areas, and they often cannot find work even as chaiwalas, much less as computer programmers. The same angst that Americans and Europeans have about the future of jobs is an order of magnitude higher in Asia. Should India aim to follow the traditional manufacturing export model that Japan pioneered and that so many others, including China, have followed? Where would that lead if, over the next couple of decades, automation is going to make most such jobs obsolete? There is, of course, the service sector, where 80% of the population in advanced economies works, and where India’s outsourcing sector still tops the world. Unfortunately, there, too, the path ahead is anything but smooth. Automated calling systems already have supplanted a substantial part of the global phone center business, and many routine programming jobs are also losing ground to computers. China’s economic progress may have been the big story of the last 30 years, but it struggles with similar challenges. While China is far more urbanized than India, it, too, is still trying to bring ten million people a year into its cities. Between jobs lost to automation and to lower-wage competitors such as Vietnam and Sri Lanka, integrating new workers is becoming increasingly difficult. Recently, the rise in global protectionism has made this difficult situation worse, as epitomized by the decision of Foxconn (a major supplier to Apple) to invest $10 billion in a new factory in Wisconsin. Admittedly, the 13,000 new jobs in the United States is a drop in the bucket compared to the 20 million (or more) that India and China must create each year, or even compared to the two million that the US needs. At the margin, the US and Europe might have some scope to make trade fairer, as Trump says he will do. For example, many Chinese steel plants have state-of-the-art pollution controls, but these can be switched off to save costs. When the result is that excess output is dumped at cheap prices into world markets, Western countries are fully justified in taking countermeasures. Unfortunately, the long history of trade protectionism is that it rarely takes the form of a surgical strike. Far more often, the main beneficiaries are the rich and politically connected, while the losers are consumers who pay higher prices. Countries that go too far in closing themselves off to foreign competition eventually lose their edge, with innovation, jobs, and growth suffering. Brazil and India, for example, have historically suffered from inward-looking trade policies, though both have become more open in recent years. Another problem is that most Western economies have long since become deeply intertwined in global supply chains. Even the Trump administration had to reconsider its plan to pull out of the North American Free Trade Agreement when it finally realized that a lot of US imports from Mexico have substantial US content. Erecting high tariff barriers might cost as many US jobs as Mexican jobs. And, of course, if the US were to raise its import tariffs sharply, a large part of the costs would be passed on to consumers in the form of higher prices. Even if protectionists could shut down outsourcing of tasks, what would the cost be? To be sure, online service platforms do need to be regulated, as early experience with Uber has demonstrated. But, given the massive number of new jobs that India and China need to create every year, and with the Internet remaining highly permeable, it is folly to think advanced economies can clamp down tightly on service exports. So how should countries deal with the relentless advance of technology and trade? For the foreseeable future, improving infrastructure and education can achieve a great deal. While the rest of the world floundered in the aftermath of the 2008 financial crisis, China continued to extend its vast logistical and supply chains. In a world where people are likely to have to change jobs frequently and sometimes radically, wholesale changes in adult education are needed, mainly effected through online learning. Last but not least, countries need to institute stronger redistribution though taxes and transfers. Traditional populist trade policies, like those that Trump has espoused, have not worked well in the past, and are likely to perform even worse now. - The headline U.S. stock market remains within striking distance of new all-time highs. - Yet a correction is already underway under the market surface. - Stocks currently have a "big" problem. Many investors have been contemplating the potential for a U.S. stock market correction starting some time over the next couple of months after what has been a remarkable year to date. Whether such a pullback on the headline benchmarks actually comes to pass remains to be seen. But in many respects, a correction in U.S. stocks has already been underway for nearly a month now. The U.S. stock market has a “big” problem. The S&P 500 Index (SPY) continues to perform exceptionally well. Through mid-August, the headline U.S. stock market benchmark continues to set fresh new all-time highs with each passing week. And the trend remains definitively higher even despite some moments of notable weakness in recent trading days. On the surface, the U.S. stock market looks as bulletproof as ever. But a closer look under the market surface reveals that trouble for stocks has been brewing for several weeks now. 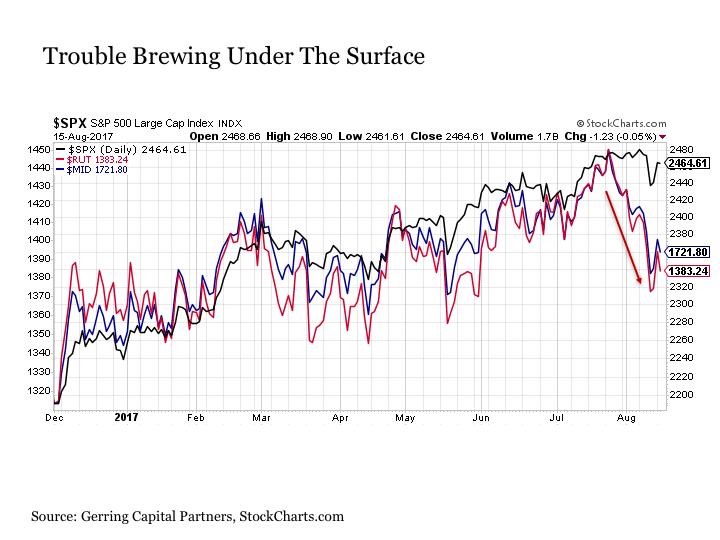 Consider the following chart of the large cap S&P 500 Index (IVV) versus two of its closely related U.S. counterparts – the mid-cap S&P 400 Index (IJH) and the small cap Russell 2000 Index (IWM) dating back to December of last year. Each U.S. market segment has moved with a very high correlation with one another. That is up until just a few weeks ago. For while the headline S&P 500 Index (VOO) continues to make its way to the upside, both mid-cap and small-cap stocks have turned definitively lower. This is a notable deviation across the size spectrum in the U.S. stock market. Zooming in on the recent weeks reveals the magnitude of the situation over the last few weeks. 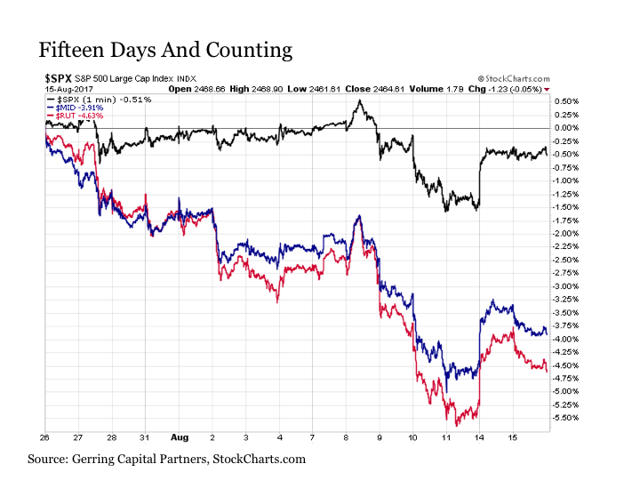 While the S&P 500 Index has held roughly flat dating back to July 25, both the mid-cap S&P 400 and the small-cap Russell 2000 have declined by as much as -5%. Moreover, despite a solid bounce early Monday morning to start the week, the short-term trend remains definitively lower for both mid-caps and small caps. Of course, a -5% pullback over the course of fifteen trading days is hardly anything that could be deemed as problematic. After all, prior to the financial crisis, a -5% correction in stocks along the way during a calendar year would be considered a part of normally functioning markets at any given point in time. But in a broader market that has felt virtually no pain for so long, a comparable pullback in the S&P 500 Index from today’s high 2,400s range to the low to mid-2,300s over the course of a few weeks with little signs of relenting would likely be jarring for many, particularly given the complacency as implied by the historically low volatility (VXX) that continues to define today’s market backdrop. 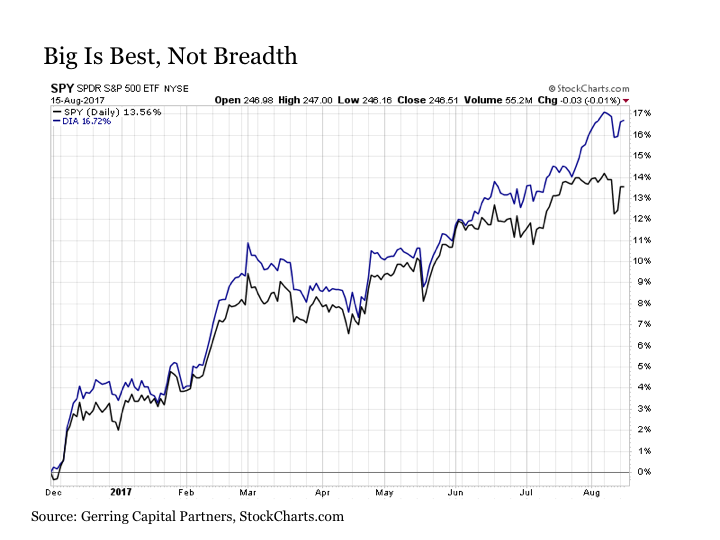 What is also notable for U.S. stock investors is that while the S&P 500 Index is higher by as much as +4% since the start of March 2017, both the mid-cap S&P 400 and the small-cap Russell 2000 Index are now lower by nearly -1.5% over this same nearly six-month time period on a total returns basis. Hardly anything that could be described as resoundingly bullish. Thus, it stands to wonder how much longer before the problems that have been plaguing the mid-cap and small-cap segments of the U.S. stock market finally start to make their way up through the large-cap ranks. Evidence exists that this downside pressure is already making its way through the large-cap index itself. 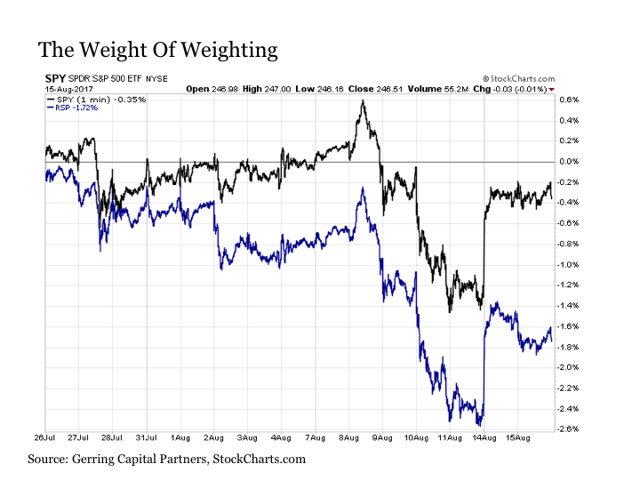 First, consider the performance of the market cap weighted S&P 500 Index where the top ten mega caps like Apple (AAPL), Microsoft (MSFT), Facebook (FB) and Amazon (AMZN) alone make up roughly 20% of the entire benchmark versus its equal weighted counterpart (RSP) where each of the 500 stocks has roughly the same 0.2% weighting. Viewing this same market benchmark through these two different lenses reveals the following. While the headline benchmark that is so heavily driven by its selected handful of largest stocks continues to hold its ground, the same index on an equal weight basis has been down by as much as -2.6% in recent days. 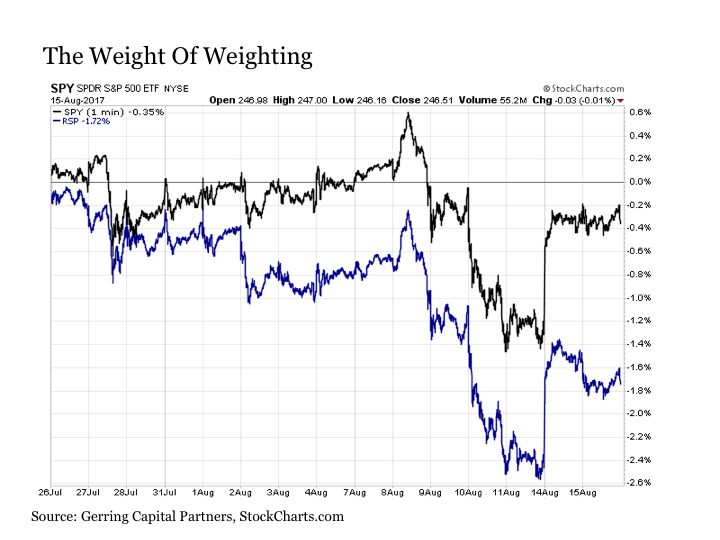 Moreover, while the equal weighted market also bounced strongly at Monday’s open, the broader trend remains to the downside much like its mid-cap and small-cap counterparts. Let’s take this size assessment one step further. Consider the performance of the S&P 500 Index versus its even “bigger” stock counterpart in the Dow Jones Industrial Average (DIA) and its relatively smaller list of 30 mega cap components. 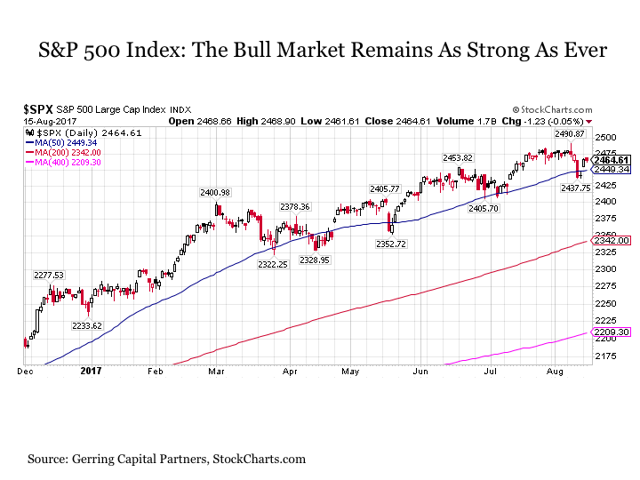 While both had been moving closely together through late July, the Dow has been surging to the upside by as much as +2.6% over the last couple of weeks while the broader market as measured by the S&P 500 Index has turned flat and the rest of the market outside of the mega caps has turned definitely lower. So, why does this all matter? So what that the largest stocks are carrying the entire weight of the market to the upside? To begin, the fact that the headline benchmark continues to set new highs is obscuring the fact that problems have been festering over the last few weeks now that is causing the rest of the stock market to falter outside of a select group of very large companies. A market that is reliant on a small handful of names to pull it higher is not a healthy one. Big should not be best for a healthy market. 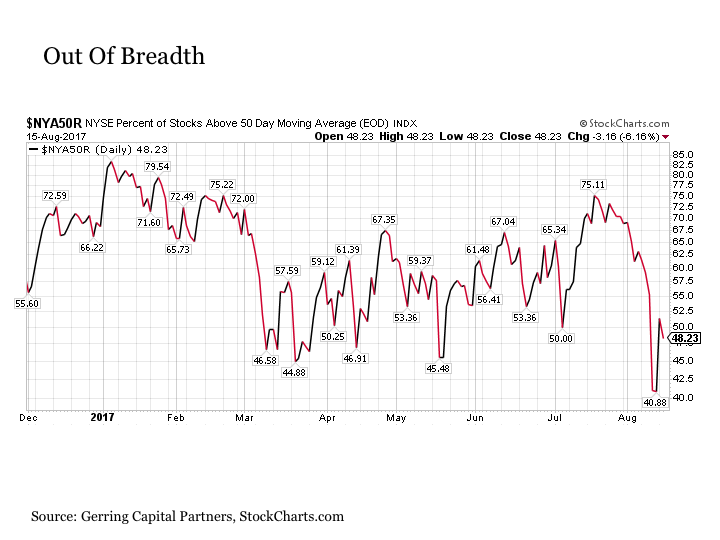 Instead, breadth is typically best. For if these big names start to falter in their own right, the market is already lacking the many other names that can step in to help pick up the slack. 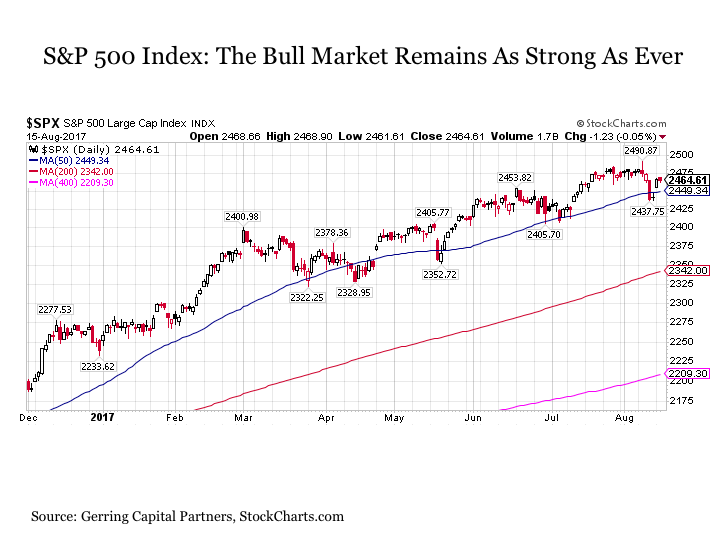 In regard to the breadth of market performance, it is as weak as it has been in some time despite the fact that the S&P 500 Index remains so close to new all-time highs. Today, less than 50% of stocks in the headline benchmark are trading above their 50-day moving average. This reading reached as low as 40% in recent trading days. In addition, while the S&P 500 Index itself is within less than 1% from a new all-time closing high, it is notable that 17% of the stocks that make up the index, or 85 stocks, are officially in bear market territory in being down more than -20% from their recent highs, 38% (190) are in correction territory at down more than -10% from recent peaks and nearly two-thirds (65%, or 319 stocks) are more than -5% lower from recent highs. None of these readings are signs of a market enjoying widespread health. Instead, they are indicative of a market that appears strong on the surface but is showing signs of sickness and deterioration underneath. How this manifests itself as we continue into what has historically been the most difficult two-month stretch for the U.S. stock market in September and October remains to be seen. If nothing else, the challenges brewing under the surface of the market suggest that now is not the time for complacency when it comes to managing the risk in your U.S. stock portfolio, as investors should be prepared for a potential bout of increased volatility in the headline S&P 500 Index if the correction that has already been underway for several weeks across the rest of the market is any indication. The ECB has faced more challenges than many central banks in recent years. Now finally it is wrestling with how to manage good news. For a central bank, even good news isn’t entirely straightforward. 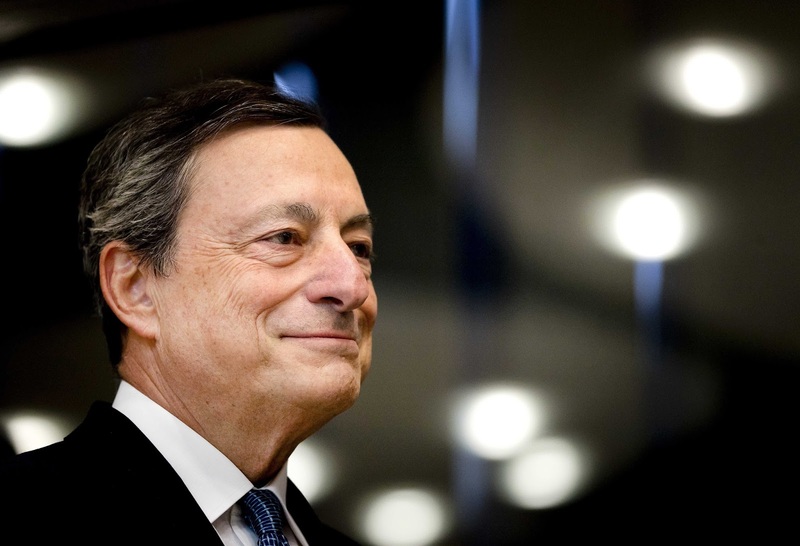 The account of the European Central Bank’s July meeting, published Thursday, betrayed clearer concerns about the rising euro exchange rate than President Mario Draghi had shown at the postmeeting press conference. Markets have been on alert for a signal from the ECB that the sharp rise in the euro—up 11.1% against the dollar and 6.5% against sterling so far this year—was becoming a worry. The meeting account duly delivered, singling out the foreign-exchange market as being at risk of “overshooting” in the future. The euro dipped briefly in response. The ECB also acknowledged that the euro was rising for good reasons, including a reduction in eurozone political risk, a brighter growth outlook, and a reappraisal of U.S. interest-rate policy. And other financial conditions remain supportive, with bond yields still low and corporate-bond spreads tight. Importantly, the account also repeated a key element of Mr. Draghi’s June speech in Sintra, Portugal, that shook markets up. As economic growth becomes increasingly self-sustaining, it is less dependent on ultraloose policy settings. The ECB, understandably, is playing for time as it waits for more concrete evidence that inflation is firming. And it noted that with financial markets hanging on central bankers’ every word, a “steady approach to communication” is important. 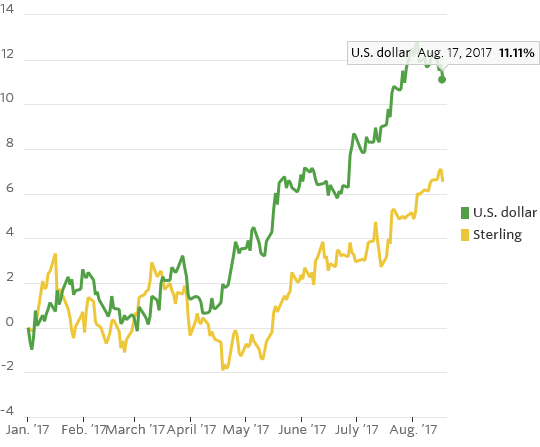 Markets have been focused on the euro because of the relative speed of its ascent since May. A further swift climb could give the ECB reason for pause. But as long as eurozone growth continues and other financial conditions remain supportive, the ECB will remain on track for a gradual winding-down of extraordinary monetary policy. Euro strength won’t be so easily upset. On Aug. 2, 1945, the United States dropped an atomic bomb on Hiroshima. The U.S. remains the only country to have ever used nuclear weapons. As part of our project to review major World War II battles, I will examine the reasoning on both sides that led to the use of this weapon. The Japanese had entered the war because of the effectiveness of U.S. economic sanctions imposed after the Japanese had invaded Indochina. As an industrial power devoid of its own resources, Japan had to import nearly all of its resources, mostly from Indochina and the Dutch East Indies. The United States feared that Japan, after dominating the Western Pacific, would soon threaten its interests in the central and eastern Pacific. Japan had treaty agreements with France and the Netherlands guaranteeing shipments of commodities. When both were overrun by Germany, it became uncertain who would control their Pacific colonies, and Japan could not live with that uncertainty. When the U.S. tried to restrict Japan’s access to certain resources in order to limit Japanese expansion, Japan had a choice: It could continue expanding and face war with the United States, or it could allow itself to become completely dependent on the United States for access to minerals. The United States saw Japan as an international outlaw that needed to be heeled by peaceful sanctions. The Japanese saw the United States as using sanctions to crush Japan’s economy. The result was war. The United States had two strategic goals. The first was to disrupt Japanese access to Southeast Asia supplies without invading the Dutch East Indies or Indochina. This meant intense submarine warfare. The second goal was to bring itself into range of Japan so that it could conduct a strategic bombing campaign. By 1945, the submarine campaign had dramatically reduced the flow of supplies, and the capture of Saipan and Tinian had brought B-29s within range of Japan. The Japanese strategy strategic goal in 1945 was to prevent the occupation of the Japanese homeland and retain the existing regime, particularly the position of the emperor. The primary strategy for this was to create a defensive system that would potentially impose unacceptable casualties on the United States. During the Pacific campaigns, the Japanese had learned that American pre-invasion bombing and bombardment were of limited value. The U.S. succeeded by forcing land battles that had high casualty rates but low casualty totals, relative to other battles in World War II, since these battles were comparatively small. This worked in the Gilberts, the Marianas and the Marshalls. What this proved, however, was that the U.S. would incur a high casualty rate in an invasion of Japan, which would require a substantially larger force. The U.S. Navy suffered the greatest casualties due to the kamikazes. The Japanese strategy therefore focused on using the kamikazes to attack the Navy and on forcing battles of attrition by layering forces, including civilians, into the interior. Although this imposed catastrophic casualties on the Japanese – estimates say a quarter million died in Okinawa – American troops also suffered severe casualties. The Japanese were betting on asymmetry of interest. They were fighting for their homeland and for a regime that was far from delegitimized. The Americans were fighting for an increasingly marginal goal – dismantling the Japanese regime. The Japanese believed that the U.S. would give up first and agree to a truce rather than requiring Japan’s unconditional surrender. This was a reasonable assumption given that the United States’ most experienced troops were already exhausted from war in North Africa, Italy, France and Germany, and its most seasoned Marines had been fighting since Guadalcanal. If the U.S. did invade Japan, the troops that would be sent were the draftees from 1944 and 1945 who were inexperienced and not yet blooded. Instead, the U.S. hoped that bombing and submarine warfare would have forced capitulation. It hadn’t. Most cities were devastated, and the condition of the economy had reduced the country to penury. But the Japanese wouldn’t capitulate. While they did send out peace feelers, they didn’t include an offer to surrender – merely an offer to negotiate a settlement. The agreement among the Allies was that only unconditional surrender was acceptable, since the U.S. did not want a repeat of Versailles after World War I. They wanted to end Japanese expansion, and a prolonged negotiation would have exacerbated the ongoing bloodshed in China. Besides, Japan had already lost credibility with respect to peace negotiations, as it had previously been engaged in such talks while its fleet was preparing for Pearl Harbor. The argument for a negotiated settlement was not nearly as obvious then as it is now. Still, the U.S. was caught in a bind. It couldn’t afford the potential costs of invading, and it also couldn’t accept anything less than total capitulation, which the Japanese weren’t willing to offer. It was this strategic situation that led to the use of atomic bombs. The atomic project was driven by German scientists and those who feared that Germany would develop a nuclear weapon. But the Germans didn’t have the resources necessary to both define the concept and create the weapon; only the U.S. was capable of such a massive undertaking during the war. But the Americans were unaware of the limitations of the German program and therefore launched the Manhattan Project, the U.S program to develop an atomic bomb. Years later, some would argue that the United States dropped the bomb to frighten the Soviets or keep them out of Japan. But the Soviets couldn’t have invaded Japan anyway; they lacked the capability to send a massive number of troops there. The Soviets, moreover, already knew about the bomb, although the U.S. didn’t realize that at the time. If the U.S. wanted to impress the Soviets, it had many ways to do it that didn’t involve bombing Hiroshima and Nagasaki. The first test of the bomb took place in July 1945, in the midst of the American strategic conundrum. Would the country accept the cost of occupying Japan when it would turn out that there was a potential alternative to massive American casualties? It’s unclear what Harry Truman would have done if the bomb wasn’t an option, but he would have been pilloried had he invaded or had he not. The country, the troops included, was tired of war and wasn’t willing to pay the cost of invasion. But a peace treaty that allowed the Japanese regime to stay intact would have left the fundamental issues that started the war unsettled. This is not an argument as to which side was more just. It is simply to say that a peace treaty wouldn’t have been a conclusive end to the war. It was clear that the Japanese leadership was prepared to accept the destruction of cities, and that the population was not prepared to rise against the regime. The Americans therefore believed that the Japanese were not prepared to surrender, which in retrospect was true. The Japanese view was that the U.S. either wouldn’t invade or, if it did, would face casualties that would cause it to accept a peace treaty. But the atomic bomb presented another potential scenario. Although Japanese cities had faced devastating attacks before, this threat was different because a single bomb could do the damage of a thousand. Moreover, the extent of the casualties from an atomic bomb was still unclear, in part due to the uncertainty of injury caused by nuclear fallout. But the Americans were focused on the psychological effect it would have. While the Bombing of Tokyo had a devastating impact, the means of death was not a mystery. The atomic bomb worked terrible magic. The suddenness and totality of the strike created a unique sense of helplessness. It was instantaneous, and it came from nowhere. There were some in the pro-war faction who argued that the bomb used on Hiroshima was simply another massive air attack and not a new weapon. The deaths and destruction were, from their point of view, bearable because it was part of a known pattern. They refused to surrender. Some even attempted a coup, which came close to success. But for some leaders, Hiroshima immediately tipped the balance to surrender. But capitulation only came after Nagasaki and after the U.S. acknowledged that the emperor would remain as a figurehead, causing him to shift his position. Ultimately, the atomic bomb ended the war, partly because of the psychological shock and partly because Japan realized that the bomb could be used against Japanese defensive forces massed to face a potential invasion. We can only speculate how many American casualties or how many more Chinese casualties this move prevented. Eight other nations have acquired nuclear weapons: the United Kingdom, the Soviet Union, France, China, Israel, India, Pakistan and South Africa. (South Africa has subsequently given up these weapons.) North Korea has developed nuclear devices but it’s unclear whether it has a deliverable nuclear weapon. None of these countries has used their weapons, though some have found themselves in circumstances where using them would have made sense. Some, particularly Mao’s China, raved about what they would do with nuclear weapons once they had them. But they didn’t end up doing what they said they would do. In a sense, they aren’t weapons designed to fight armies. (Tactical nukes might be an exception, although they have also not been used.) They seem to have a sobering effect. The question today is whether the magic of these weapons might sober North Korea or Iran. Some argue that it would sober North Korea, the more immediate and more important case. Human history, and specifically the 20th century, are filled with nations that committed acts of political depravity – but not, even in the case of Stalin or Mao, nuclear depravity. The problem is that it’s hard to build a national policy on the assumption that nuclear weapons moderate the depraved. In making the decision to use a nuclear weapon, the U.S. faced some tough choices. It had to balance its moral responsibility to American troops and those who were still being slaughtered by the Japanese against the lives of those who would be killed in a nuclear attack. But the idea that Japan was ready to surrender is a myth. It was ready to negotiation a peace deal; it wouldn’t accept unconditional surrender. This could have opened the door to another war, allowing the slaughter of Americans who had already fought and survived a long war. But it did deeply sober the United States. It opened an abyss the U.S. and all the other nuclear powers looked into and recoiled from. Their use may well have prevented a global nuclear war between the U.S. and the Soviet Union. But will the sobering effect of nuclear weapons extend to other countries like North Korea? Or will a nuclear North Korea embrace the abyss? This is not a geopolitical question as much as a psychological one. - Apple, Alphabet, Microsoft, Facebook, and Amazon are now the five largest U.S. market capitalization equities. - Collectively their performance in 2017, the past three years, and the past decade has been amazing. - They have also absorbed a tremendous amount of capital, sucking it away from other opportunities, and their run may be ending. "A 60:40 allocation to passive long-only equities and bonds has been a great proposition for the last 35 years … We are profoundly worried that this could be a risky allocation over the next 10." "Bull markets are born on pessimism, grow on skepticism, mature on optimism, and die on euphoria"
Life and investing are long ballgames." For active, value-orientated investors, the current bull market in U.S. stocks, which began in March of 2009, has been one of the most difficult bull markets to navigate in history. 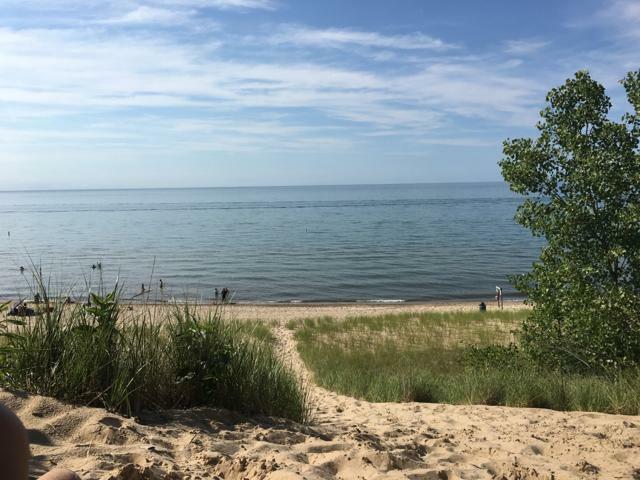 Said another way, it has not been anything like a day at the beach. Keeping up with the market, without owning the five biggest market capitalization stocks, which are all large-cap growth stocks and listed in order of size, Apple (AAPL), Alphabet (GOOGL), Microsoft (MSFT), Facebook (FB), and Amazon (AMZN), has been nearly imposible. A strong performance by the largest stocks spurred investors, speculators, and fund managers to allocate to these equities in ever-greater quantities, creating a self-reinforcing circle of buying exacerbated by the continued inflows into passive index funds and ETF funds. The answer is that it may finally be time to step outside the black hole that is consuming a disproportionate amount of investor's capital. Simply avoiding shares of AAPL, which I was bullish on previously, GOOGL, MSFT, FB, and AMZN could be one-key to investment outperformance over the next decade. The largest companies have consumed investor capital at an ever-increasing pace, forcing more and more investment managers to become closet indexers, closing active investment strategies, and creating a bigger opportunity for the remaining active investors. Apple, Alphabet, Microsoft, Facebook, and Amazon have had extraordinary performance in 2017. AAPL shares are up 30% year-to-date, GOOGL shares have gained 21%, MSFT shares are up 19% in 2017, FB shares lead the pack with a remarkable 50% year-to-date gain, and AMZN shares are up a strong 36% even after their minor stumble Friday. For perspective, the S&P 500 Index, as measured by the SPDR S&P 500 ETF (SPY), is up a strong 11.5% YTD through Friday, July 28th, 2017, but the leading benchmark index, which is benefiting from some of the same tailwinds as the FAAMG equities, clearly trails the performance of the FAAMG stocks. The three-year performance picture is similar, with AMZN shares up an eye-opening 218%, while GOOGL shares are the laggard, with a gain of 60%, that still is far ahead of SPY's 33% advance. The five-year performance chart shows more of the same, with only AAPL shares in line with the still very healthy gains of SPY. While AAPL shares have lagged over the past five years, they have been the second best performer over the past decade, gaining 694%, trailing only AMZN's 1114% return over the past decade. In summary, with the benefit of hindsight, investing in the large-cap growth sector a decade ago, in the middle of the developing turmoil in the financial markets, would have been one of the best decisions an investor could have made, in a world that was ultimately growth challenged following the 2008/2009 bear market. Apple's current market capitalization is $780 billion, Alphabet's is $658 billion (with its two share classes combined), Microsoft has a $564 billion market-cap, Facebook's market capitalization is $501 billion, and Amazon's market capitalization is $488 billion. The sheer size of these companies is staggering, with the smallest, Amazon, making up 2.2% of the S&P 500 Index, and the largest, Apple, making up 3.5% of the S&P 500 Index. Individually, Apple, Alphabet, Microsoft, Facebook, and Amazon's market capitalizations are bigger than entire sectors of the S&P 500, including the Utilities, Real Estate, Materials, and Telecommunication sectors, as shown in the graphic below. Collectively the market-cap of the five largest companies in the S&P 500 Index is roughly $3 trillion. The next largest company in the S&P 500 Index after Apple, Alphabet, Microsoft, Facebook, and Amazon is Berkshire Hathaway (BRK.A), (BRK.B), with a combined market cap of $429 billion between its two share classes. Following Berkshire is Johnson & Johnson (JNJ), which has a market-cap of $355 billion, Exxon Mobil (XOM), which has a market-cap of $337 billion, JP Morgan (JPM), with a market-cap of $324 billion, and Wells Fargo (WFC), with a market-cap of $266 billion. As a group, the next five largest companies have a combined market capitalization of approximately $1.7 trillion. For perspective, the current market capitalization of the S&P 500 is roughly $22.3 trillion, so Apple, Alphabet, Microsoft, Facebook, and Amazon, make up roughly 13.5% of the index, as of this writing. Additionally, with a market capitalization of $4.7 trillion, the ten-largest companies make up approximately 21.1% of the S&P 500 Index. For a historical perspective, 1999's year ending market capitalization of the S&P 500 Index was $12.3 trillion. The top-ten companies at that time, Microsoft, General Electric (GE), Cisco Systems (CSCO), Wal-Mart Stores (WMT), Exxon Mobil, Intel (INTC), Lucent Technologies, International Business Machines (IBM), Citigroup (C), and American Online had a combined market capitalization of $3.1 trillion. The top-ten largest market capitalization companies in the S&P 500 Index in 1999 accounted for 25.2% of the index, which is higher than today's comparative 21.1% weighting. Additionally, the top-five largest market capitalization companies in 1999 were 16.7% of the index, which is bigger than today's 13.5% comparative weighting. 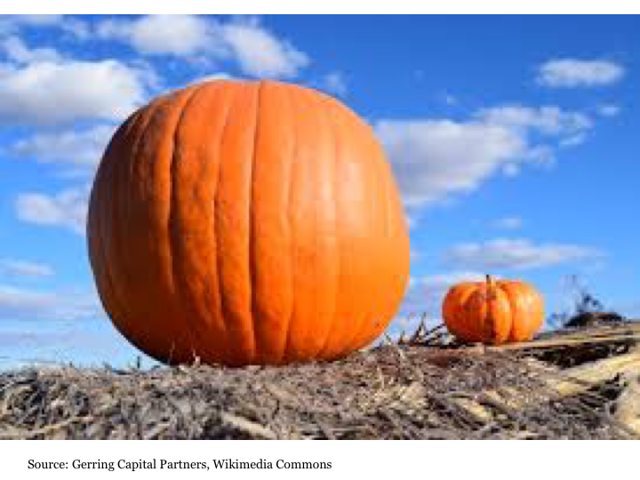 The calendar year 1999 had the highest equity valuations in modern market history, so it is difficult to draw conclusions, comparing the current market capitalizations to 1999's investing landscape. With that thought in mind, I decided to look at data from 1994, and 1990. The 1990s were glory days for the U.S. stock market, and the 1995-1999 time frame sported some of the best returns for the S&P 500 Index in its storied history. In 1995, the total return for the S&P 500 Index was 37.6%, in 1996, the total return was 23.0%, in 1997, the total return was 33.4%, the total return in 1998 was 28.6%, and 1999 concluded with a gain of 21.0%. Because of the strong capital appreciation, the total market capitalization of the S&P 500 roughly quadrupled from year-end 1994 to year-end 1999, going from $3.3 trillion to $12.3 trillion. 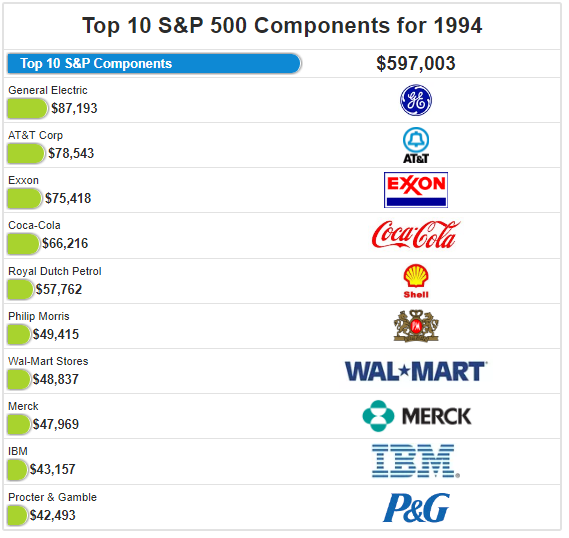 Thus, I thought it would be interesting to take a look at the top S&P 500 companies and their associated market capitalizations at the end of 1994. Collectively, the top-ten companies in the S&P 500 Index had and aggregate market-capitalization of $597 billion in 1994, representing 17.8% of the index, which is less than today's 21.1% weighting for the top-ten S&P 500 companies. 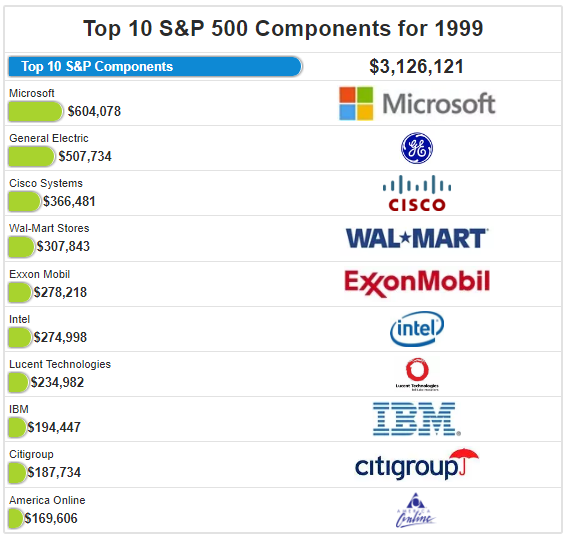 The top-five S&P 500 companies in 1994 had a market capitalization of $365 billion, and this added up to 10.9% of the S&P 500 Index, materially lower than today's 13.5% weighting collectively by Apple, Alphabet, Microsoft, Facebook, and Amazon. Interesting, Microsoft did not make it into the top-ten market capitalization companies until 1995, where it placed tenth, despite rapid growth in revenues, and profits ever since its March 13th, 1986 IPO. To provide one more comparison, I looked back to 1990. 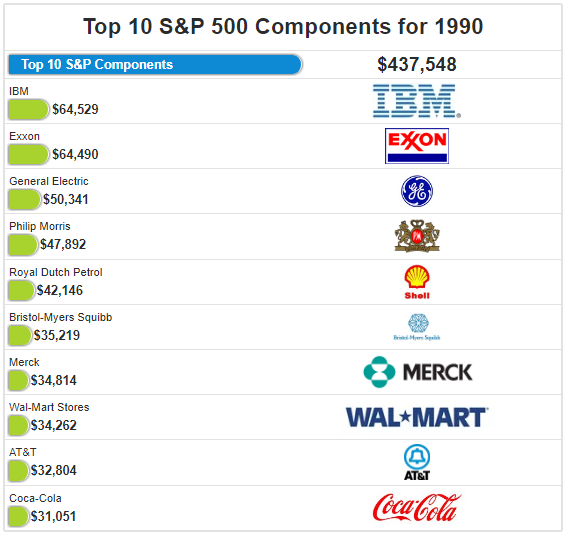 Here are the top-ten S&P 500 Index companies from 1990, listed in order of market capitalization. IBM was the largest company in 1990 by market capitalization, followed by Exxon, General Electric, Phillip Morris, Royal Dutch Petroleum, Bristol-Myers Squibb (BMY), Merck, Wal-Mart, AT&T, and Coca-Cola. Collectively, their market capitalization was $438 billion, and they represented 20.0% of the roughly $2.2 trillion total market capitalization of the S&P 500, compared to today's 21.1% weighting. The top-five companies had a combined market cap of $269 billion, representing 12.3% of the S&P 500's market capitalization, compared to today's 13.5% weighting for Apple, Alphabet, Microsoft, Facebook, and Amazon. In summary, compared to 1994, and 1990, today's top-five and top-ten S&P 500 companies represent a bigger portion of the total market capitalization of the index, yet the concentration of the top companies has not yet grown to 1999's levels. Technology stocks that are growth companies, typically trade at a premium to the market, and the valuation ratios for Alphabet, Microsoft, Amazon, and Facebook are certainly trading at premiums today. Apple is the notable exception, as its price-to-earnings and price-to-cash flow ratios trade at a discount to the broader market. The valuation data presented in the tables above, which is organized by ticker symbol and presented in order of market capitalization, shows that Apple shares are arguably undervalued, or at least the most fair priced by traditional valuation ratios, while Alphabet and Microsoft are premium priced growth stocks, and Facebook and Amazon continue to trade at extraordinary valuations. Specific to Facebook and Amazon, the current price-to-earnings ratios are off the charts, particularly for AMZN, but their price-to-cash flow ratios are also at a premium to the market, and a premium to Apple, Alphabet, and Microsoft. Having said this, their current growth rates are higher, and the projection of these higher growth rates, infinitely into the future, has led to higher share prices today for FB and AMZN. The difficulty for all these very large companies, especially technology companies, is anticipating the future results. This is compounded by the fact that, historically, having five technology companies as the largest market capitalization companies is a rare feat. The only era that resonates for me, off the top of my head, is the Nifty 50 era of the 1970s, and we know how that ended. Despite trading at premium valuation ratios, the five largest market capitalization stocks today, Apple, Alphabet, Microsoft, Facebook, and Amazon have had room to appreciate further in 2017, and they have been some of the best-performing stocks in the entire stock market. Historical comparisons show that if the top market capitalization equities follow 1999's pattern, they could gain further market capitalization relative to the market. Thus, the black hole could get bigger, sucking in more investor's capital. However, when looking back to 1994, and 1990, concentration levels today are higher in the top-five, and top-ten, S&P 500 market capitalization equities. The combination of a low global growth environment over the last decade, which has caused investors to bid up the few viable growth stocks, and the room for historical appreciation potential, at least when compared to 1999, has given investors and speculators room to bid up FAAMG stocks further. There are two problems with this from my view. First, the five largest equities in the S&P 500 Index today are all technology stocks, which are inherently volatile with regard to their future projections. Adding to this point, as investors, we saw what happened to the large-cap technology leaders in 1999, notably American Online and Lucent Technologies. Building on this narrative further, even prosperous technology market leaders from 1999, including Cisco Systems, Microsoft, and Intel, have collectively treaded water for nearly two decades, striving to grow into their premium market capitalizations. The second issue, which is an important one, revolves around the S&P 500, passive investing, and the U.S. market specifically. I touched on this in my previous article, " Its 1999 All Over Again," and I will cover this in more detail in the next installment of this series, and it is a game changer, in my opinion. With that preview and tease, thank you for your readership.